The SPREAD SPECTRUM RADIO provides a low cost alternative to point to point and point to multi-point wiring by allowing data to communicated wirelessly rather than over wires. 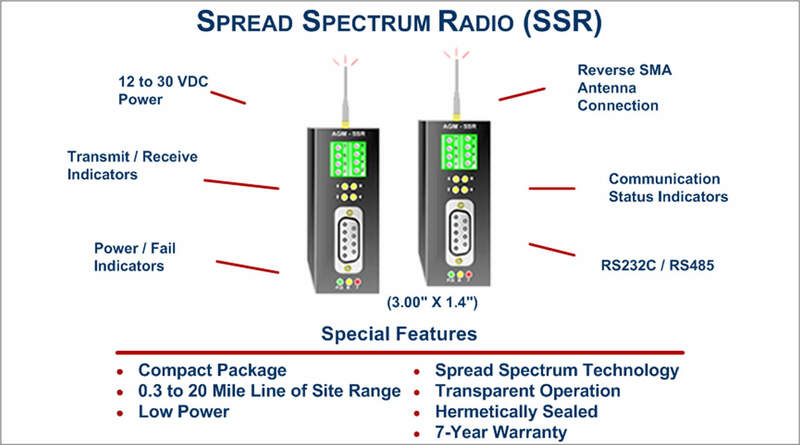 Whether your requirement is accessing data from a site where no power is available or linking equipment together when using wires is cost prohibitive or the equipment you need to access is in motion then the SPREAD SPECTRUM RADIO is for you. Spread Spectrum Technology: Frequency Modulation and Frequency Hopping algorithms ensure minimal interference from electrically noisy equipment and other environmental factors that normally degrade the integrity of wireless data telemetry. Low Power: Higher radio signal sensitivity and better filtering techniques means lower power requirements. This makes the SPREAD SPECTRUM RADIO perfect for those isolated sites where it is impractical or cost prohibitive to run power to. Use batteries or solar power instead. Transparent Operation: The SPREAD SPECTRUM RADIO can be used with any product whose protocol uses 7 or 8 bit asynchronous data transmission. This includes but is not limited to: ASCII MODBUS, RTU MODBUS, DF1 or DNP3. Hermetically Sealed: The SPREAD SPECTRUM RADIO is completely "potted" in silicon rubber making it impervious to the elements commonly found in harsh environments. RS232C/RS485: The SPREAD SPECTRUM RADIO may be wired either for a RS485 or RS232 system. When used with RS485 the Port will automatically switch to RS232C for configuration. Either full RS232C or 3 RS232C may be used. Compact Package: Due the small 3.0 X 1.2 X 2 inch size, the SPREAD SPECTRUM RADIO makes Mobile/Portable wireless data acquisition practical and affordable. o Power / Transmit activity (Green). · Modulation Type: Spread Spectrum, Frequency Hopping Wide band FM. · Channel Capacity: 7 hop sequences sharing 25 frequencies. · Transmit Power: 140 mW. · RF Data Rage: 9600 baud, Fixed. · Receive Buffer Size: 16 bytes. NOTE: Ranges specified are typical. 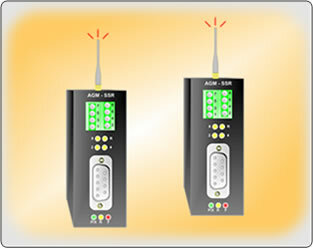 Actual range will depend on several factors including antenna type, distance above ground, and presence of obstructions. The following table is a compilation of a few of the many applications that the AGM Spread Spectrum Radio (SSR) can be applied to. If you have an application that you are uncertain as to whether or not the Spread Spectrum Radio is the correct product to apply, contact AGM's Technical Support Team and they will work with you to insure that the correct product is selected for your design requirements. You may Email, Fax or Mail your order. Orders are shipped by the next business day.